I am not a lawyer. I cannot and will not speak to Florida’s “stand your ground law,” nor to the complexities of the legal definitions of “second-degree murder” and “manslaughter,” nor to the meaning of “self-defense” as found in the 27 page set of instructions given to the 6-member jury. I will not pass judgment on the jury or on the lawyers on either side. But on the night of February 26, 2012, George Zimmerman passed judgment on 17 year-old Trayvon Martin. The grounds for judgment? Skin color. My younger son’s favorite snack growing up was Skittles. My thoughts and emotions immediately went to him when I read that Trayvon was walking home from a convenience store where he had bought Arizona Iced-Tea and Skittles. If that had been Devin out that night in that neighborhood, with Skittles in his pocket, he would have come back to his mom and dad unharmed. Now, be honest. We know this is true. But when black 17year- old Trayvon Martin went out that night just to get a snack, he ended up dead. Some people believe this case has nothing to do with race, that Trayvon’s Blackness was inconsequential to his death. I wonder if that perception is held only by those who’ve not been on the receiving end of racism or profiling. If you don’t buy the “color-connection” ask yourself: Why did Trayvon seem suspicious? Why was his hoodie threatening to Zimmerman? No one, to my knowledge, has been suspicious of Mark Zuckerberg in his hoodie. Zimmerman’s own words are incriminating. Remember his words to the police dispatcher when he called in to report seeing Trayvon walking in his neighborhood: “F-king punks. These a**holes. They always get away.” Why would he think Trayvon was a “punk”? Had Trayvon “gotten away” from something in that neighborhood? When the defense put up as a witness a white woman who had been robbed by black men as central to why Zimmerman picked out Trayvon to follow and stalk – it says it all. Was she robbed by Trayvon? No. So why should he be suspect? Sounds like profiling, doesn’t it? My dad never had such a conversation with me. I never had such a conversation with my sons. There was no need. 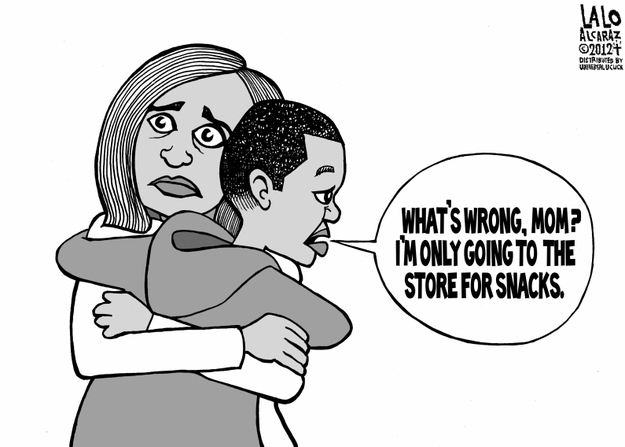 Black parents have to teach their children not to wear hoodies. But white people don’t need to have any such conversation. Do we get it? Do we know what it’s like to be a black youth? To be under suspicion just because of how we look? I don’t. I don’t know what it’s like to walk down the aisle at the grocery store and see the lady coming toward me reach down and grab her purse that is sitting in her grocery cart – or meet a lady in the mall and see her move her purse to the shoulder farthest away from me. Friends of mine in Springfield, MO do know what that’s like. They aren’t white. No, I can’t speak to the legal proceedings, reasonings and deliberations in the George Zimmerman trial. I don’t know if it was George Zimmerman or Trayvon Martin who threw the first punch, or who was on top of whom. But without the profiling, there would have been no punch – no shot – no death. I want to be, I need to be more like Jesus. How about you? Happy 4th of July. Happy Birthday USA. We live in the land of the free because this was the home of some very brave people. One of these brave individuals is Roger Williams. I grew up in a Baptist home, went to and pastored Baptist churches, received my undergrad and graduate education at Baptist schools. So Roger Williams was as much a hero to me as Stan Musial is to Cardinal Nation. Yep. Roger Williams established and pastored the first Baptist church in the New World, located in Providence, Rhode Island. Oh, he founded the town of Providence as well, giving it that name because he figured that God’s providence had led him there – God’s providence and Roger’s rebel spirit. Williams rebelled against the religious philosophy and practice of the day, which was basically, “my way or the highway,” or “my way or the stocks or sword”. The Puritans came to these shores to find religious freedom, but when they got here they turned it around and denied it for everyone else. “You’re free to think, believe, and act like us.” New England residents who didn’t attend worship services were put in the stocks. People of other faiths were often forced to pay higher taxes or kicked out of the colony. This “my way” approach was personified in John Winthrop, the Governor of Massachusetts, the “City on a hill” guy. Roger Williams was a Bible scholar, holding a high view of Scripture. Yet, he recognized the difficulty in reconciling contradictory scriptural passages as well as different Bible translations. Given these complexities, Williams judged it impossible for any human to interpret all Scripture without error. So, he considered it “monstrous” for one person to impose any religious belief on another. That kind of thinking might get you fired – or in William’s case, banished. Roger Williams had once been considered as pastor of the Puritan church in Boston – a great job! Yet his ideas were too radical. 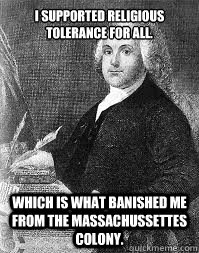 The authorities found him guilty of spreading “newe and dangerous opinions” and banished him from the Massachusetts Bay Colony. The colony’s leaders agreed that his position was nothing less than “Satan’s Policy.” Williams found a safe place with the Narragansett Indians whose chiefs sold land to him and his followers. They established a new settlement and named it Providence. Its reason for existence, its claim to fame was complete and absolute religious liberty. Rhode Island became a safe haven for all sorts of religious outcasts and misfits -people who would not let the establishment make spiritual decisions for them. Fast forward 150 years. Our founding fathers were putting together a government for the USA. “Which way do we go?” The way of John Winthrop or the way of Roger Williams. The way of religious intolerance or the way of liberty? The way of government enforcing religious principles upon the people or the way of a wall of separation. The American experiment could have gone in the direction of John Winthrop and, yet, it went in the direction of Roger Williams. Freedom. We love and appreciate it. Many have died for it. It was Roger Williams who planted the seeds of religious liberty that we enjoy today. Want a great book on Roger Williams? Check out Roger Williams and the Creation of the American Soul by the premier historian John M. Barry.